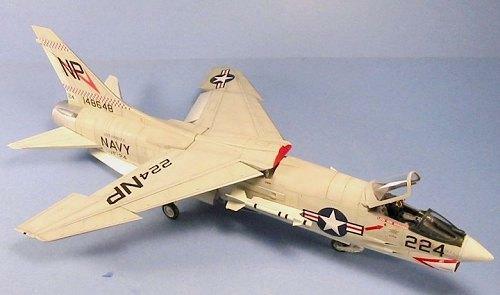 Here is the Hasegawa F-8 done as an F-8H using the full Cutting Edge conversion set and Meteor Productions decals. The airplane was lucky from the beginning. In 1952, as a result of U.S. government legal action, United Aircraft – of which Vought Aircraft was a component company – was broken up, with Vought left to fend for itself right after making an expensive move (at government request) from its original Connecticut factory to Dallas, Texas. Vought had always been on the cutting edge as regarded the development and production of naval aircraft, going back to the VE-7, the first U.S. Navy carrier-based airplane. The F4U Corsair was considered a contender for the title of “best piston-engine fighter ever built,” and was in fact still in production, though the end was in sight. In any case, the Corsair was “yesterday’s technology,” and Vought had not been able to create a successful follow-on design; the F6U “Pirate” being underpowered and the F7U “Cutlass” being both underpowered and “difficult” to mate to a carrier. Vought was in need of success if the company was to remain a viable organization. By 1952, the U.S. Navy was well aware that their current jet fighters were outclassed by the opposition; they were so desperate to get an airplane that could match the MiG-15 that they went and bought a navalized version of the MiG-killing F-86 Sabre, which they called the “Fury.” The first generation of what were supposed to be supersonic fighters – the Douglas F4D “Skyray” and the McDonnell F3H “Demon” – were saddled with the awful Westinghouse J-40 engine, which didn’t deliver the promised power, and for which Westinghouse seemed unable to find a fix. The Navy needed their next design to be a “winner,” to put the service back in the leading position it had held with the Grumman Hellcat and Vought Corsair during the Second World War. Vought’s submission, which would become known as the F-8 “Crusader,” was lucky from the beginning. Freed of the requirement to use the dreadful J-40, Vought was able to use the wonderful J-57 – a jet engine that provided high power and great fuel economy. The J-57 had saved the Skyray, and with a new afterburner was set to power the Air Force’s first fighter capable of supersonic speed in level flight, the F-100 Super Sabre. Though Vought’s design team was creating their airplane prior to Dr. Richard Whitcomb’s publication of The Area Rule, it turned out they had managed to get “the area rule” so right that the F-8 became the first fully-supersonic fighter that didn’t “look funny” with a “coke-bottle fuselage” or a “wasp waist,” design excrescences which were forced on other designers once the aerodynamic rules for supersonic flight became known. The result of this would be that the Crusader, powered by the exact same engine as the F-100, would end up with greater speed and greater range than its Air Force competitor. The entire wing other than the folding outer section and the control surfaces, was a gas tank, while other tanks were provided throughout the long fuselage; it was also the first supersonic wing to have the needed “dog-tooth” in the design from the beginning. The wing-body shape of the Crusader was so right that the airplane ended up a generation ahead of all of the competition, world-wide. Mating a high-performance fighter like the Crusader to a carrier deck was the big problem, and Vought’s solution was truly elegant: the first variable-incidence wing, which – coupled with full-span leading edge slats and drooping ailerons – allowed the fuselage to remain at an angle that provided the pilot with sufficient visibility for a carrier landing, while not forcing such loads onto the landing gear that would result in the usual weight escalation for naval aircraft in this area. The mechanism for operating the wing weighed in at 500 pounds, while the gear was 500 pounds lighter than would have been the case with any other airframe configuration, which meant the wing was “free.” Of the eight designs submitted to the Navy, the Crusader was the only one which could provide such performance while still exhibiting the docile flying qualities the Navy needed. The first XF8U-1 flew on March 25, 1955, powered by the Air Force version of the J-57, the P-11, which provided less power than the definitive Navy version, the P-12. Even thus “underpowered,” Vought Chief Test Pilot John Konrad easily took the Crusader supersonic in level flight – out to Mach 1.2 – on its first flight. Further tests demonstrated that in comparison with the F-100, the Crusader had longer range, faster climb, more rapid rate of roll,, a smaller turning circle at all speeds and heights, as well as lower and shorter landing. De-navalizing the Crusader would have resulted in a world-beating land-based fighter. So few changes were found necessary that the third Crusader delivered was the first full-production aircraft – the only visible change being the addition of a flight refuelling probe on the left side of the forward fuselage, resulting in a “bulge” that actually added to aerodynamic smoothness; other than that, the other major change was putting in the wiring to allow the Crusader to use the Sidewinder missile from the outset. On August 31, 1956, CDR R.W. “Duke” Windsor took one of the first production F8U-1s up to 36,000 feet over China Lake, California, pushed the throttle forward as he entered a 15-kilometer course, and set a national speed record of 1,015 m.p.h. – the first time a non-experimental airplane had flown this fast – for which he was awarded the 1956 Thompson Trophy. In April 1956, the Crusader made its first carrier landing aboard the U.S.S. “Forrestal,” followed within six month by successful operation from a 27-Charlie conversion of the World War II-era “Essex” carrier. On July 16, 1957, the Crusader burst onto the front pages of the newspapers when an F8U-1P was flown from Los Angeles to New York in 3 hours, 23 minutes, 8.4 seconds, for an average transcontinental speed of 726 m.p.h., or Mach 1.1. In fact, the Crusader, which had to come down from 35,000 feet to 25,000 feet and slow down to 320 m.p.h. to refuel three times from AJ-2 Savage tankers, was actually flying in full afterburner at Mach 1.7 for the majority of the mission. The Marine aviator who won the Distinguished Flying Cross for this feat would become far better known four and a half years later when LCOL John H. Glenn Jr. became the first American to fly in orbit in February 1962. Like almost everyone who ever flew a Crusader, former Senator Glenn was quoted over the years as saying the Crusader was the best airplane he ever flew. 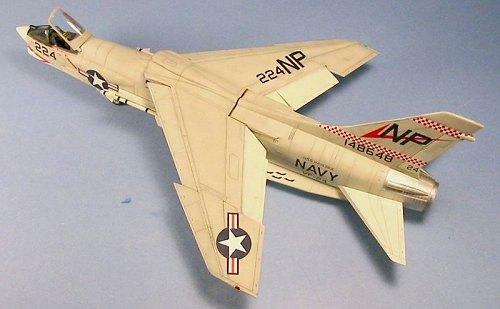 In December 1957, Vought won the Collier Trophy for having designed the Crusader. In 1962, Vought became involved in remanufacturing the original F8U-1 (F-8A) aircraft, and this updating process would provide the F-8H (rebuilt F8U-2N/F-8D), F-8J (rebuilt F-8E), F-8K (F8U-1N/F-8B) and F-8L (F8U-2/F-8C), the latter two of which were used as advanced trainers. The F-8H – only slightly slower in its rebuilt version than the F8U-2N – was the first re-built Crusader to go to war in 1967, and was the leading MiG-killer in Vietnam, with more than twice as many kills as the F-4 Phantom. Among the F-8 pilots to score MiG-kills was LCDR Bob Lockwood of VF-24 “Red Checkertails,” flying off the U.S.S. “Hancock,” the first squadron to take the F-8H into combat. 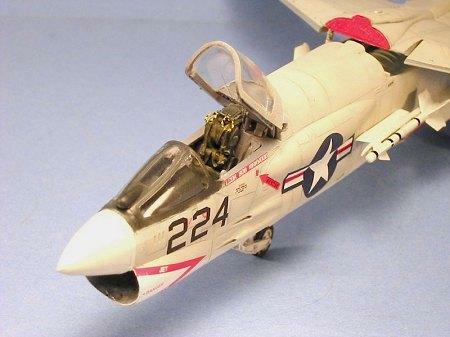 On June 21, 1967, he proved the power of the Crusader when he shot down a MiG-17 at low altitude just south of Hanoi, after a long tail chase and a “down in the weeds” gunfight between the two aircraft. Lockwood’s victory would be the last all-gun kill by any U.S. fighter. The F-8 Crusader remained in first-line U.S. Navy service until 1976, when the last of the 27-Charlie class carriers was decommissioned. Yours truly first saw a Crusader parked on the ramp at NAS North Island in 1962, looking like it was going a thousand miles an hour just sitting there. It’s the last jet fighter that gets my adrenaline pumping just to look at it. 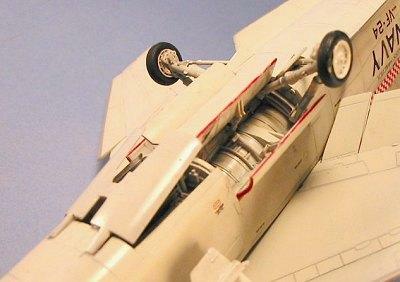 This Hasegawa kit was modified with the Cutting Edge conversion set, which provides a resin cockpit and seat, resin intake trunking, resin dive brake and main gear well, and flaps and slats for the wings. 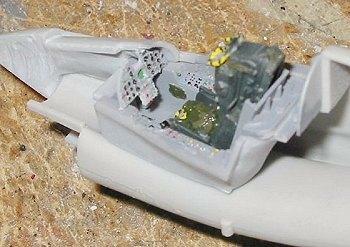 The result is a really stunning-looking model when completed. I used the Meteor Productions decals to do the F-8H flown by Bob Lockwood on his MiG-killing mission. Beautiful F-8 Tom, and better back story. It takes me back to “discovering” Naval Aviation in 1965-66 in 4th-5th grade. 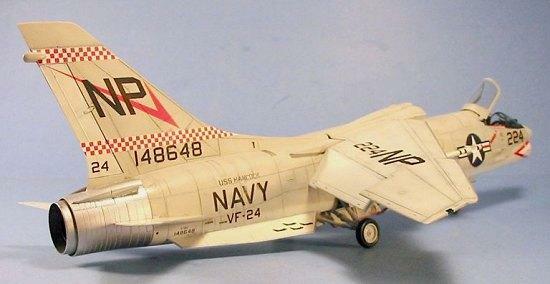 I was already an airplane nut being an Air Force brat, and I knew the Navy had planes, mostly due to Monogram & Revell. Then I found an old book the library was throwing away that was full of picture of Fury’s, Demon’s, Savages and the like. 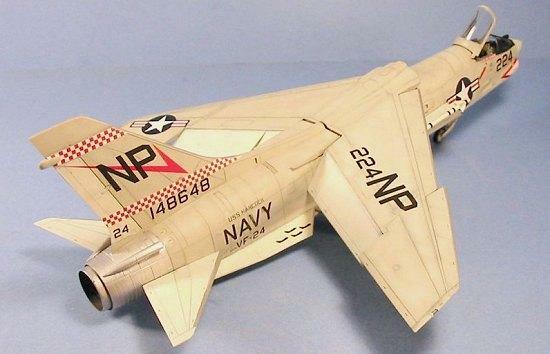 I was amazed at these cool planes I’d never seen, especially the newest fighter in the fleet the F8U Crusader, that ran rings around all the USAF’s fighters. I wish I still had that book, but all I can remember is it had sea foam green fabric cover with a title something like Fly Navy. It was in the same vein as Robert Loomis’s 1959 book The History of the US Air Force & had to have been published about the same time. Sorry to drag you down memory lane, but I’m hoping you or some one else remembers enough about that book to help me find one. Beauty Tom! And thanks for the history brother, you know that’s my favorite part!! Good on ya. Interestingly, this book was also a refugee from a high school library, found in an antique shop. Hi Gary, I finally found some info on “Wings of the Navy”, but not enough to be sure. The book I remember was a youth level narrative history with pictures. The section I remember most was about life on a carrier, that’s when I learned what a “gedunk ” was (is). Does “Wings…” fit that? Do you get tired of me saying love the model, love the story?